The two most common software platforms used to deliver intranets and extranets are Microsoft's IIS and Apache. While IIS is available for use with Microsoft Windows NT and 2000 servers, Apache can be used on Linux, Apple Mac and Windows operating systems, making it a better choice for extranets and even web hosting on the Internet. Microsoft also produces a cut-down version of IIS called Personal Web Server (PWS), which can be installed on a workstation. 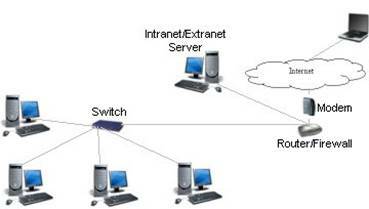 The diagram below shows a typical intranet set-up, where access to the intranet is through the network or Internet, but traffic is filtered through a firewall.